August 28th in Viral, Wordpress Plugins by Wordpress Jedi . Polls, surveys and quizzes are useful tools to use to increase user engagement on your website. You don’t need to write tons of code to add such interactive features to your website. Take the Modal Survey plugin for instance: it is a survey builder that lets you add unlimited quizzes to your website. You can use it for timed quizzes, personality tests, product recommendation, and everything in between. Modal Survey allows you to change width, position and colors easily. 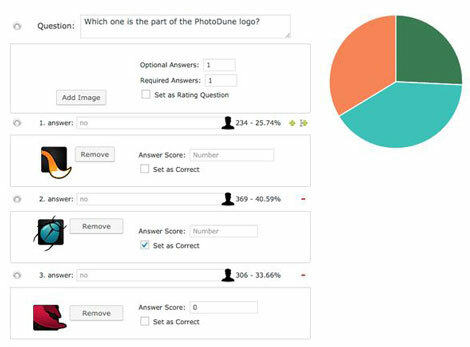 You get a visual interface to customize various elements of your surveys. The plugin can visualizes the results to help you make better sense of the data. Webmasters can embed quizzes anywhere on their pages or posts. Once you have gathered all the data, you can analyze or export everything to PDF, XML, CSV, XLS and JSON. You can also display votes in various chart types and styles.